In a week when taxes and tax returns have dominated the headlines, billionaire investor Warren Buffett jumped back into the political debate and showed his returns exclusively to ABC News' Bianna Golodryga, adding, "I have never had it so good. … What has happened in recent years, we were told a rising tide would lift all boats, but the rising tide has lifted all yachts." 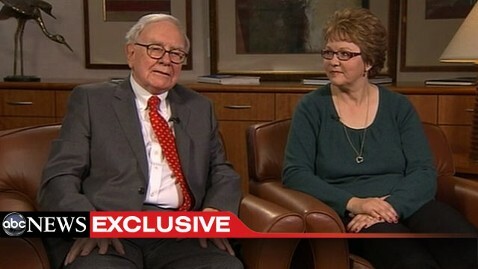 Buffett's secretary since 1993, Debbie Bosanek, sat next to her boss just hours after being invited by the president to the State of the Union address, where the president made her the face of tax inequality in America. "I just feel like an average citizen. I represent the average citizen who needs a voice," said Bosanek. "Everybody in our office is paying a higher tax rate than Warren." During Tuesday night's State of the Union address, President Obama, for the first time, put a minimum percentage figure on the amount of taxes the ultra-rich should pay - 30 percent - an idea that has been referred to as the "Buffett rule." "The question is what is fair when you have to raise multi-trillions to fund the United States of America," said Buffett. "[Raising taxes] will not change my behavior. I have paid all different kinds of rates and I've always been interested in making money. I believe this should be a defining issue. Debbie works just as hard as I do and she pays twice the rate I do." Buffett, a Democrat and Obama-supporter, had one question for Mitt Romney: "Do you think the tax system should be perpetuated?" He doesn't blame the former Massachusetts governor or any of the ultra-rich for paying lower tax rates than most Americans and challenged Congress to make a change. "I don't pay hardly any payroll taxes," Buffett said. "Gov. Romney hardly pays any payroll taxes, Newt Gingrich hardly pays any payroll taxes. Debbie pays lots of payroll taxes." He lashed out at assertions from many Republican leaders that the "Buffett rule" is class warfare. "If this is a war, my side has the nuclear bomb," Buffett said. "We have K Street. … We have Wall Street. Debbie doesn't have anybody. I want a government that is responsive to the people who got the short straw in life."